Accompanied by the Orchestra Santa Cecilia, German operatic tenor Jonas Kaufmann performs Nessun Dorma from Turandot, an opera in three acts by Giacomo Puccini, completed by Franco Alfano, set to a libretto in Italian by Giuseppe Adami and Renato Simoni. 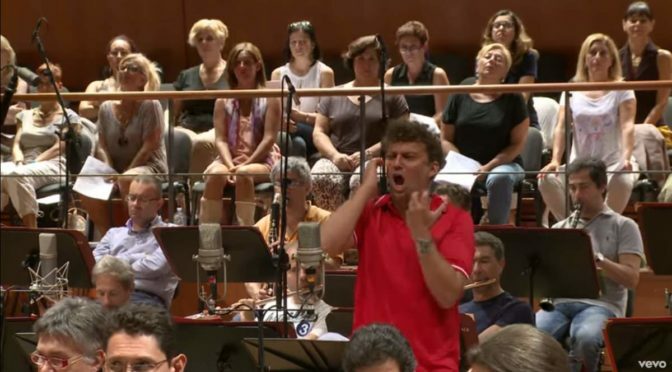 Conductor: Antonio Pappano. Taken at the recording session of “Nessun Dorma – The Puccini Album”. Jonas Kaufmann dedicates his new album to the most popular Italian opera composer of all time, Giacomo Puccini. This brand new recording features one of the most famous and loved arias of all time, ‘Nessun Dorma’, alongside stunning pieces from Manon Lescaut, La Boheme, Tosca and more. You can get the Album here here. Get the live DVD here. Another live performance by Jonas Kaufmann, with the BBC Symphony Orchestra and Chorus conducted by Marin Alsop at the Last Night of the Proms 2015 (with English subtitles). Nessun dorma is one of the best-known tenor arias in all opera. It is sung by Calaf, il principe ignoto (the unknown prince), who falls in love at first sight with the beautiful but cold Princess Turandot. However, any man who wishes to wed Turandot must first answer her three riddles; if he fails, he will be beheaded. Prince Calaf attempt the impossible. Prince Calaf answers: “Hope!”. Correct. Silence falls over the crowd. A few moments later, Calaf shouts, “Turandot!” He is right again. The crowd cheers and congratulates Calaf, thankful his life was not lost and future lives were saved. Nonetheless, the cruel princess recoils at the thought of marriage to him. She pleads with her father to spare her marriage to Prince Calaf, some stranger. Her father refuses. Prince Calaf, in order to appease the princess, offers her another chance by challenging her to guess his name by dawn. (As he kneels before her, the Nessun dorma theme makes a first appearance, to his words, “Il mio nome non sai!”) If she does so, she can execute him; but if she does not, she must marry him. The cruel and emotionally cold princess then decrees that none of her subjects shall sleep that night until his name is discovered. If they fail, all will be killed. che tremano d’amore, e di speranza!